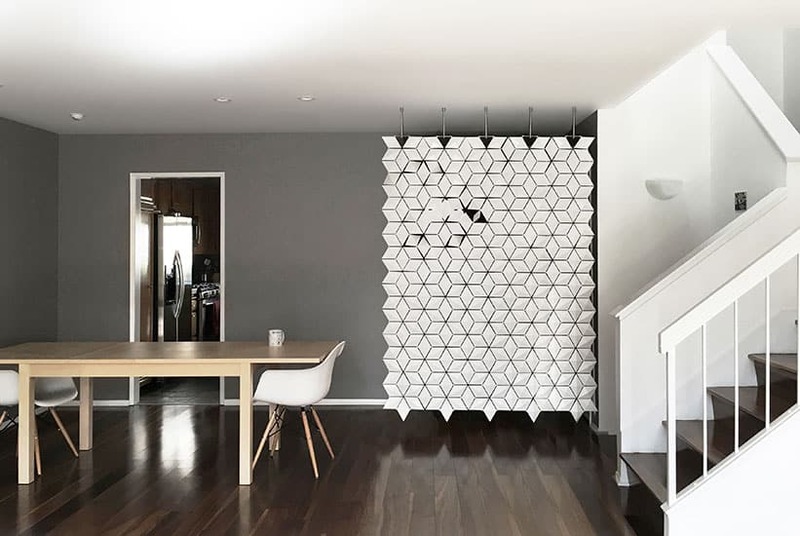 If your entryway and interior is completely open to the rest of your house, you might feel the need for some kind of partition. Our entryway divider, Facet, can help you out in that. Our beautiful room divider screen does not take up a lot of space and it offers a warm and stylish welcome in your entry hall. An entryway divider with an unforgettable impression. Facet is a beautiful and truly unique screen. It will be the first thing people see when they enter your house, so you want to make sure it looks good (and tidy) and is welcoming while still providing enough privacy. Facet fit this description perfectly. Its striking pattern is something your guests will admire straight away. It forms a privacy screen, but, seeing as it the screen is not completely solid, you get a slight glimpse of what is on the other side of it. This offers an inviting welcome and the needed privacy. Our entryway divider also has a unique feature. The entire screen is made up of diamond-shaped facets. These facets are not stationary, but can be turned around to face different angles. By changing them around, you can change the look of your screen. The pattern changes as well as the amount of light that filters through the screen. If you want more light to shine through from the one side to the other, or if you want the other side to be more visible, then you can achieve that by adjusting the diamond-shaped parts. Facet is not only offered in predetermined, standard sizes, instead you can give us the dimensions you need it in and we will assemble it specifically for you. We designed Facet in such a way that you can personalize it to match your style and work in your space. When ordering your entryway divider, you can also choose from a selection of colors. Interior decoration is a very personal thing; we want you to be able to make Face your own. This particular entryway divider seen in the pictures is installed in a private home in Calabasas, California, USA. It separates the entrance from the living room without interfering with the lovely open character of the house. Interior design was done by 2-LA.